The Beauty of Toy Organization! I am an Early Intervention Physical Therapist who works with children from birth to 2 years of age in their natural environment. I wanted to share these easy tips to keeping playtime more organized and purposeful. For me, it leads to more productive Physical Therapy sessions in the home. Each set of toys has a place. 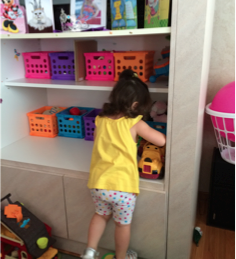 The child, pictured above, knows where to put the toys away. For example, each of the stacking cups and books are in separate bins. 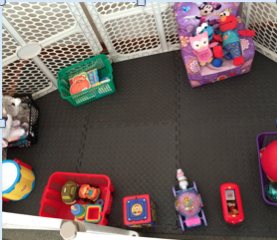 Make sure the toys are accessible and the child can see all of the toys when he/she looks into the bin. A toy box filled with smaller toys is very overwhelming for a child. Instead, put dress up or larger stuffed animals in there. Children learn through play. When they are presented with too many toys they have a tendency throw or dump the toys. It is important to sit down and teach a child how to use the toy. The child will attend better if there are fewer options. This entry was posted in General info, Tips from therapists and tagged Early Intervention, Easter Seals, Easter Seals Bucks Division, Easter Seals of SEPA, Easter Seals of Southeastern PA, Easter Seals of Southeastern Pennsylvania, physical therapy on October 16, 2015 by Easterseals.